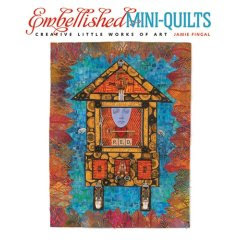 This is a great book for eye-candy, but not one that I would recommend to someone who is looking for the basics of making art quilts. If you’ve got experience, you’ll find it a treasure trove of ideas. If you haven’t, you’ll find it beautiful and lush, but frustrating in the details it leaves out. Actually, the book briefly profiles some amazing quilt artists and then moves directly into specific quilts that they’ve made, outlining the process. Due to this, the directions are of variable detail, as to be expected with multiple authors. I really don’t intend this warning as a criticism of the book: no book can be all things to all people. Still, if you’re unsure about your own proficiency, you might want to take a look at a copy first before you splurge on it. Some of my favorite artists are in here (Frances Holliday Alford, Larkin Jean Van Horn), so to me it’s quite worth it!